There are two things in life that come to mind when people think, “I am dreading this.” First is moving from one place to another, because that’s a lot of work. Second is hosting a big event where you have to feed and entertain people. Again, that’s a lot of work. 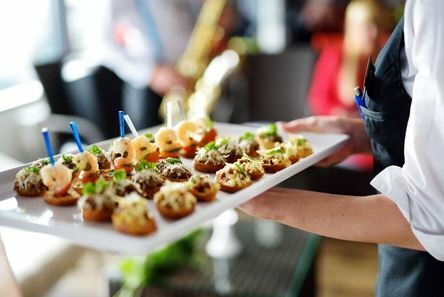 What are some ways a caterer can help you? First, hiring a caterer for your event will save you a lot of work, energy and effort. Planning an event takes a lot of time and those who do so often like to be able to devote their time to making sure guests are happy. They can’t easily do that if they’re responsible for barbecuing chicken, cutting up vegetables, finding silverware, napkins and garbage bags, and all the other stuff that goes with meal prep and clean-up. When an event planner can “hand off” the meal prep duties to a capable caterer like R&R, that’s a load off their backs. Next, hiring a caterer is a great way to look good. It nonverbally communicates to guests that the party organizers thought highly enough of them to have a professional cooking company come prepare a delicious meal for them… rather than a) asking everyone to bring a dish to pass or b) somehow having a select few handle “all that,” even though they should be enjoying the party rather than working it! Also, when you hire a caterer you gain access to a lot of different foods that will enhance your party or event. Caterers are typically known for certain dishes they make– the kind that guests “ooh and aah” over and talk about even days later– “Wasn’t that so good? I’ve never had anything like it before. What a treat,” they’ll rave. Caterers often like to present their creations in an attractive, professional and flattering way. Therefore, they take the time to garnish things and add something “extra” so that the food is the kind people will want to photograph before they eat it. Caterers can bring style and sophistication to events. Finally, caterers can customize menus and handle crowds both big and small. Are you thinking of having a party where 100 people will be there, hungry? R&R Caterers can handle that! Contact us at 215-638-7376 for more info.